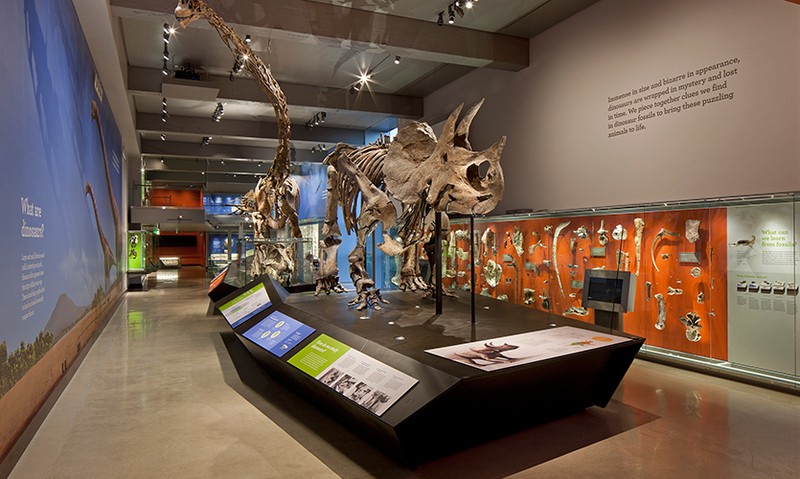 Dinosaurs are one of the core offerings at the Natural History Museum in Los Angeles, with many one-of-a-kind and scientifically significant specimens. 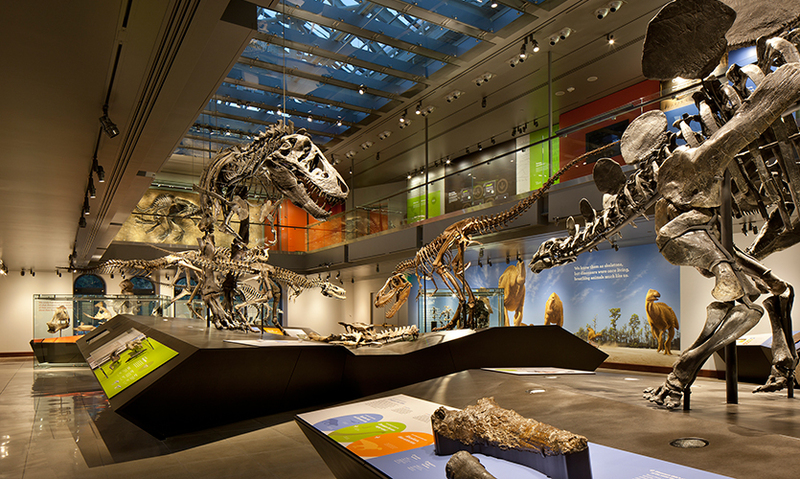 In July 2011, the museum opened the new, 14,000-square-foot Dinosaur Hall to highlight the latest dinosaur discoveries and bring the process of scientific investigation to life. The hall fills two large historic galleries, both with windows on one side. One gallery also features a massive, newly restored skylight. A key goal was to maximize use of this abundant natural light, selecting materials that bridge the historical architecture of the space and provide a contemporary yet timeless design vocabulary for the exhibit. KBDA created an exhibition program that would appeal to multigenerational families and school-age children on field trips, accommodating “streakers,” “strollers,” and “readers.” Each exhibit section features a floor-to-ceiling mural that introduces the section’s theme, to help visitors find their own paths. 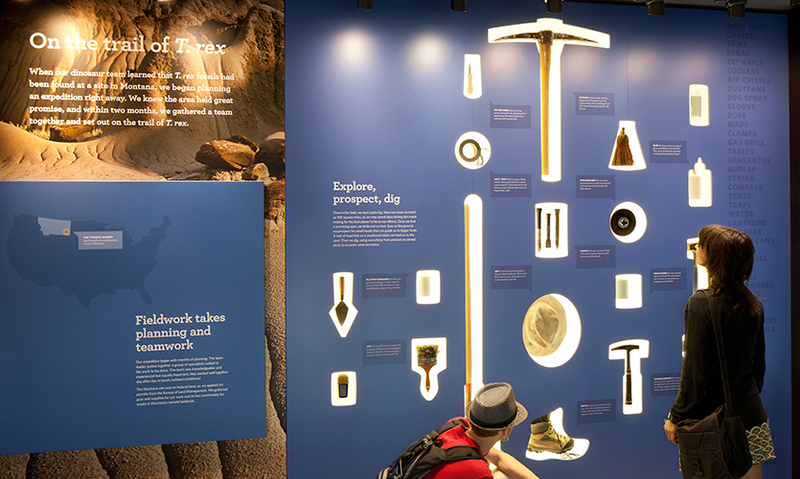 The hierarchy of information throughout the hall is designed to help visitors navigate, identify topics of interest, and discern key take-away messages. 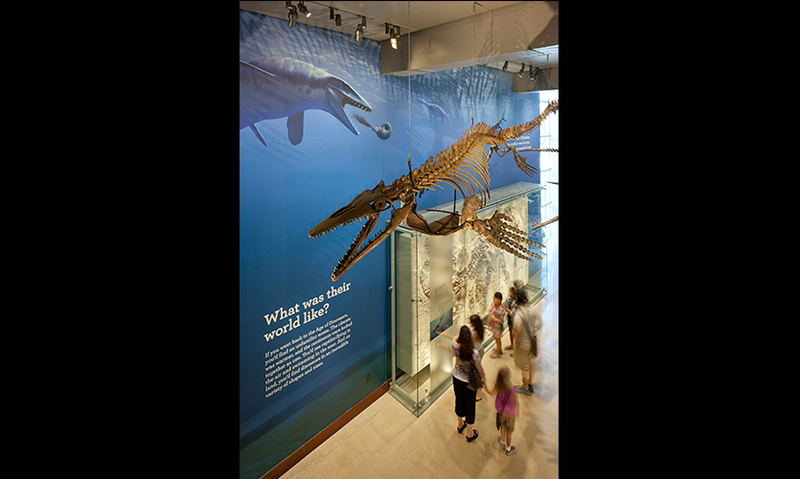 Bold, colorful graphics help integrate real fossils, infographics, maps, engaging text, and multimedia interactives to provide multiple points of entry. 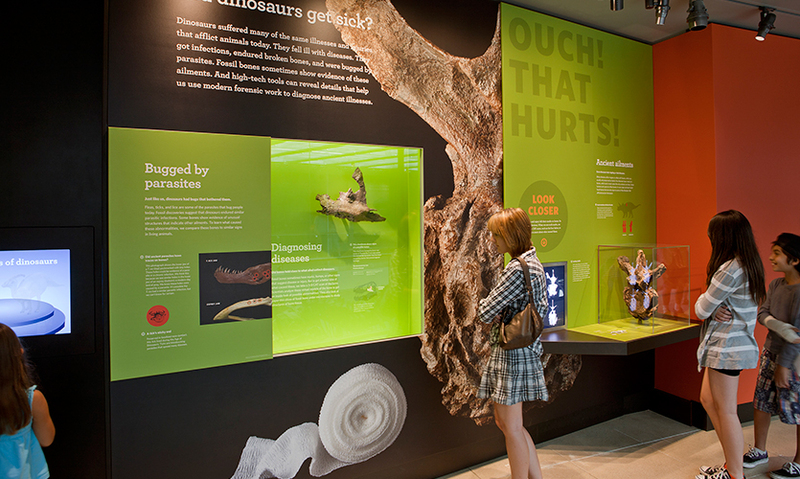 Integrated surfaces for graphics, touchable specimens, and screens eliminated the need for separate label rails throughout most of the exhibit. 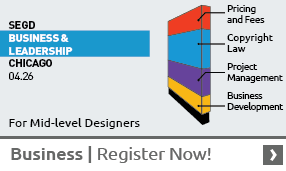 Recognizing the exhibit would be popular and heavily used, the touch-friendly platforms and graphic panels are constructed with durable and eco-friendly materials. 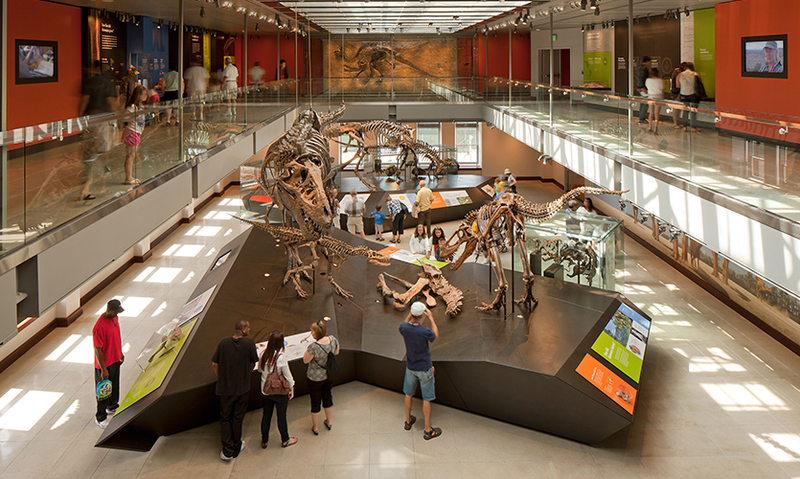 The ground floor plan was organized around the central questions the exhibit asks about the processes of science and dinosaur discovery. Because visitors consistently indicate that they come to the museum to see “the real thing,” displaying real specimens and allowing visitors to get as close as possible were key goals. Mounted skeletons stand on trapezoidal platforms that present no barriers, yet are designed so that specimens cannot be touched. The mezzanine level leverages its Beaux-Arts symmetry, organizing content around two parallel “adventures”—Discoveries in the Field and Discoveries in the Lab. Modules on each side are clearly signaled, letting visitors self-select what they want to explore with each visit. 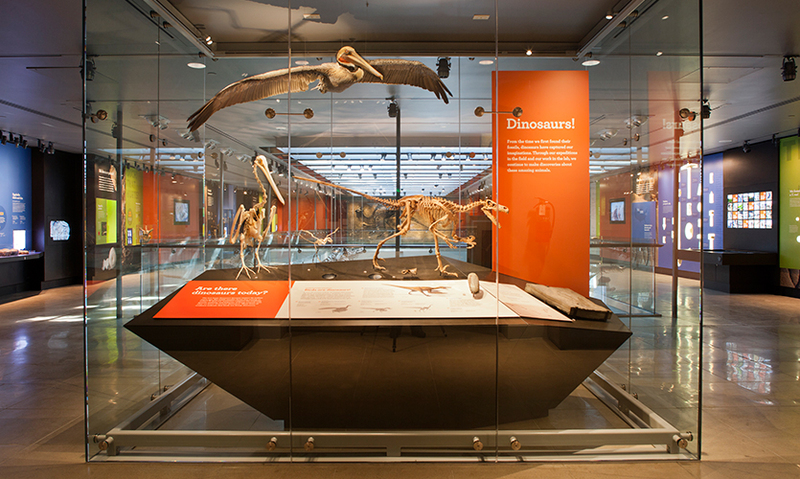 Mezzanine views also allow visitors extremely rare vantage points to the specimens below. Information is provided at key overlook points to answer questions that are inevitable when visitors find themselves almost eye-to-eye with some of the largest specimens in the gallery.